The Romeo y Julieta No.3 is a complex and mild-medium Coronitas, 4.6” (117mm) long, of 40 ring gauge, and comes in aluminum tubes in a 15 cigars box. Exclusively hand-rolled using long filler since 2002, they are also only sold in aluminum tubes. These are the shortest of the of the No. series by the brand, smaller than the more famous No.2. It has the brand's unmistakable taste, flowery and woody aromas, mixed with fruits, and sweet tobacco, with a mild to medium body. It is very aromatic and very straight forward, which makes it a perfect smoke for an inexperienced smoker or for an outdoor activity as it will remain safe and fresh in the aluminum tube. 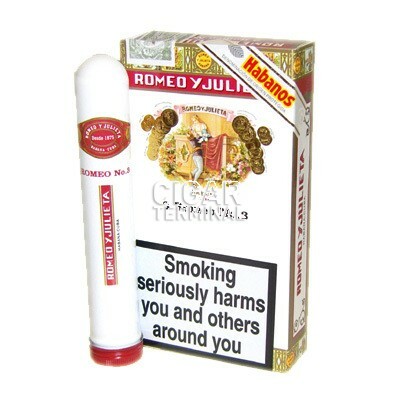 The Romeo y Julieta No.3 Tubos is a very good option for a lazy morning smoke or an outdoor activity. •	Very smooth flavors of cedar, leather, flowers and fruits. •	A mild to medium cigar, perfect smoke for a newcomer to Habanos. This cigar is simply a delightful experience that never disappoints. The cigar is looking very good; the wrapper is pale but looks flawless. The cigar is firm between the fingers, just a slight give. But it is silky smooth to the touch. The wrapper smells of wood, cedar like, and tobacco. The cigar cuts nicely and easily, the pre light draw is giving some earth aromas and some tobacco on the lips. The draw is good all cigar long, perhaps a bit on the open side. Once lit, there are mild flavors of nuts with a woody aftertaste. The cigar burns cool, each draw creating plenty of smoke. The burn line is clean and even, the ash is of gray color and holds on for about an inch long. The first third of the cigar is mild in strength and flavors. The dominants flavors are of cedar, tobacco, and leather flavors. There are also some floral aromas, spices, some sweetness and hints of coffee. The cigar burns well, the smoke is cool and abundant. The ashes hold well. In the middle third, the flavor profile remains similar to the first third, lots of wood, leather, and the spices (white pepper) are more and more pronounced, especially on the aftertaste. The flavors are slightly stronger than in the first third, but it is overall still in the mild to medium body. In the final third, the spices fade away a little bit; you are left with mostly wood and some aromatic aftertaste. Overall, the flavors are ramping up just a bit; the cigar is now a medium bodied smoke. It is never too harsh however, it is very smooth, and can be enjoyed until the last half inch.